Japan has conducted its first launch of 2015 Sunday with Mitsubishi Heavy Industries lofting a radar reconnaissance satellite with the aid of its H-IIA carrier rocket. 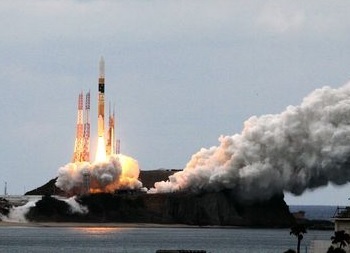 Liftoff, from the Tanegashima Space Centre, was on schedule, at the beginning of a thirteen-minute window that opened at 10:21 local time (01:21 UTC). The Joho Shushu Eisei (JSE) series of satellites, commonly known in English as Information Gathering Satellite (IGS), is operated by Japan’s Cabinet Satellite Intelligence Centre. The IGS programme consists of optical and radar imaging spacecraft; the satellite which will be deployed on Sunday is the sixth radar satellite and the thirteenth overall for IGS, including two prototype optical satellites. Japan initiated the IGS programme following North Korea’s attempted launch of the Kwangmyŏngsŏng-1 satellite in August 1998; a launch which overflew Japan and demonstrated North Korea’s ability to develop a rocket capable of attacking Japan. The satellites are constructed by Mitsubishi Electric and launched by Mitsubishi Heavy Industries using the H-IIA rocket. The first two IGS satellites – one an optical imaging spacecraft and the other a radar imager – were launched together in March 2003 atop an H-IIA 2024. A second dual-launch, later in 2003, ended in failure after one of the H-IIA’s solid rocket motors failed to separate – the only failure the H-IIA has suffered in its twenty six flights to date. After the failure, IGS launches resumed in 2006 with the deployment of a lone optical satellite; a radar spacecraft followed in 2007, launching with a prototype second-generation optical satellite. Launches of operational second-generation satellites began in November 2009 with the fourth IGS Optical spacecraft; another second-generation optical spacecraft followed in September 2011. The radar element of the constellation has also entered its second generation, with spacecraft launching in December 2011 and January 2013. The 2013 launch also carried a prototype for the third-generation optical IGS spacecraft. Sunday’s payload is a further second-generation radar satellite which will provide the constellation with redundancy in the event that one of the two spacecraft already in orbit malfunctions. The additional satellite was constructed after both first-generation radar satellites failed within four years of launch to guard against such an occurrence with the second-generation spacecraft. A further IGS launch is expected to occur later this year, with the first third-generation optical imaging satellite. Further launches to replenish and upgrade the constellation are expected to continue in the coming years. The H-IIA that was used in Sunday’s launch flew in the 202 configuration; its smallest configuration which has been used for all launches since 2009. A two-stage vehicle, the rocket consists of fully cryogenic first and second stages; fuelled by liquid hydrogen and liquid oxygen. Two SRB-A3 solid rocket motors provide additional thrust to the first stage during the early phase of the flight. The H-IIA 202 is one of two configurations the H-IIA can fly in, the other being the 204 which uses four SRB-A3 motors to increase its payload capacity. The H-IIA 204 has only been used once, for the December 2006 deployment of an experimental communications satellite. Two further configurations were used during the rocket’s early years of service; the 2022 and 2024 variants had two or four Castor-4AXL strap-ons respectively, in addition to a pair of SRB-As. These versions were discontinued in 2008 when enhancements to the SRB-A design negated the performance advantage offered by the Castors. The rocket that performed Sunday’s mission sported the flight number F-27, and marked the rocket’s twenty-seventh flight. It flew from Pad 1 of the Yoshinobu Launch Complex, or LA-Y, at the Japan Aerospace Exploration Agency’s (JAXA) Tanegashima Space Centre. Constructed for the short-lived H-II rocket in the 1990s, the Yoshinobu Complex consists of two pads; the second of which was constructed for the H-IIA in the early 2000s. To date, all H-IIA launches have used Pad 1, with Pad 2 being used in practise exclusively for the larger H-IIB which deploys H-II Transfer Vehicle spacecraft to resupply the International Space Station. The H-IIA’s first stage is powered by an LE-7A engine which ignited two to three seconds before liftoff. When the countdown reached zero, the vehicle ignited its solid rocket motors and begin its ascent into orbit. Although details of the mission profile have not been published, it will likely follow a similar flight plan to previous launches to sun-synchronous orbits. The twin SRB-A3 boosters will have burned for about the first 99 seconds of the mission before their thrust tails off to the point at which they are no longer providing sufficient thrust to aid the vehicle. Approximately nine seconds later hydraulic actuators will have been activated to jettison the spent motors from the rocket. Separation of the payload fairing will have occurred during first-stage flight; four or five minutes after liftoff. Depletion and burnout of the first stage is likely to have occurred around six minutes and fifty seconds after launch, with stage separation following eight seconds later and second stage ignition six seconds after that. Powered by a single LE-5B engine, the second stage will have made either a single burn with a duration of around eight minutes, or two shorter burns, to achieve a sun-synchronous orbit. The most likely flight profile would call for one burn, with spacecraft separation shortly after its completion. 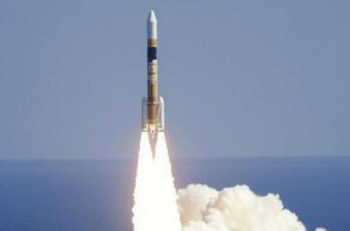 Sunday’s launch was the fourth of 2015, and the first for Japan. The H-IIA’s next launch is scheduled for March or April, carrying an optical reconnaissance satellite for the IGS series. Two further H-IIA missions are expected to occur towards the end of the year; the first orbiting the New X-ray Telescope (NeXT), also known a ASTRO-H, an international astronomical observatory and the second carrying Telstar-12V, the first commercial communications satellite to be launched aboard a Japanese rocket. In August, Japan is expected to launch an H-IIB rocket with the fifth Kounotori spacecraft to transport cargo to the International Space Station.